As anticipated, the Duke and Duchess of Cambridge are spending part of their summer with the Queen and Prince Philip at their Scottish holiday home, Balmoral Castle. 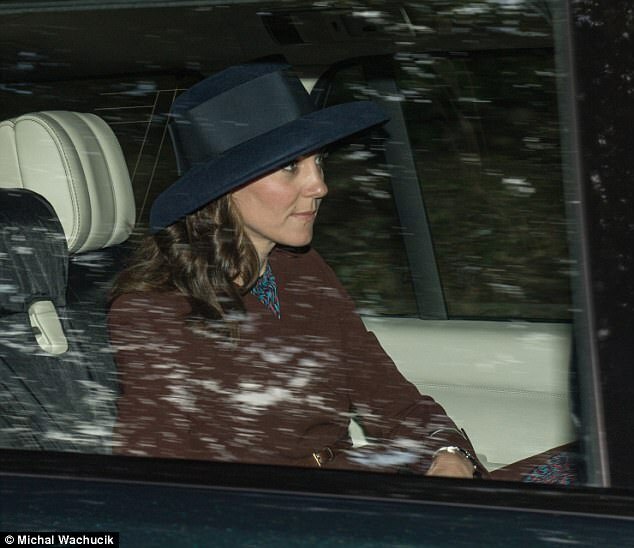 On Sunday, the royal family were photographed driving to a church service at the nearby Crathie Kirk. The Duchess donned a mix of familiar pieces. She wore her Hobbs London 'Celeste' coat atop her LK Bennett 'Addison' dress. The chestnut brown Hobbs coat has been a favourite of Kate's since she first wore it on Valentine's Day in 2012 for a visit to Liverpool. She has worn it on many occasions since then, mainly for church services. Kate first wore the 'Addison' dress when the Obamas visited Kensington Palace in April 2016. The Duchess topped off her look today with her navy Lock & Co. 'Breakfast at Tiffany's' hat first worn in March this year for a Service of Dedication.